The LHCb experiment is studying the differences between matter and antimatter through the decay of particles containing beauty and charm quarks. If there is no difference between matter and antimatter then the rate at which a B0 meson (containing an antibeauty quark and a down quark) decays to a positively charged kaon and a negatively charged pion should be the same as the rate at which an anti-B0 meson decays to a negatively charged kaon and a positively charged pion. These two processes are related by the CP operation. Measurements from LHCb show that this is not the case. The rate of the B0 meson decay is about 20% larger than the rate of the anti-B0 meson decay. By combining information from sets of detected particles, it is possible to calculate the mass that would have been possessed by the parent particle that decayed to produced them. The so-called reconstructed mass has a well-defined value if the sets of detected particles really come from a particle decay, or has a random value otherwise. Repeating this process for many different combinations and adding the numbers to a graph will give rise to a peak indicating the number of times that the decay actually occurs. In the LHCb experiment, for example, peaks have been obtained for B0 and anti-B0 mesons decaying to a kaon and a pion. Differences in the peak heights signal a difference between matter and antimatter. Most of the mass of the visible matter in the universe is associated to baryonic matter, i.e. to protons and neutrons that are bound together in atomic nuclei. Protons and neutrons are built from a combination of three quarks (protons are two up-quarks and a down-quark, neutrons are two down-quarks and one up-quark). It is also possible to build particles from quark-antiquark pairs; these particles are referred to as mesons. Mesons don’t tend to hang around for very long before breaking apart into lighter particles (lighter mesons, electrons, muons and neutrinos) but can be studied in experiments. Neutral mesons (which carry no electric charge) have a very strange property; quantum theory allows them to change from a quark-antiquark pair into a antiquark-quark pair, i.e. for matter to change into antimatter and vice versa. This matter-antimatter oscillation has been studied by the LHCb experiment using neutral B0s mesons, and is another area where the difference between matter and anti-matter can be studied. The LHCb experiment has measured the frequency of these oscillations between B0 and anti-B0 and between B0s (beauty quark and antistrange quark) and anti-B0s (antibeauty quark and strange quark) mesons very precisely and uses them as a tool to study CP violation. LHCb counts the number of B0(s) and anti-B0(s) mesons as a function of the time between their production and decay. This number decreases exponentially as the time difference increases due to the decay of the mesons and is modulated by a clearly visible oscillation. 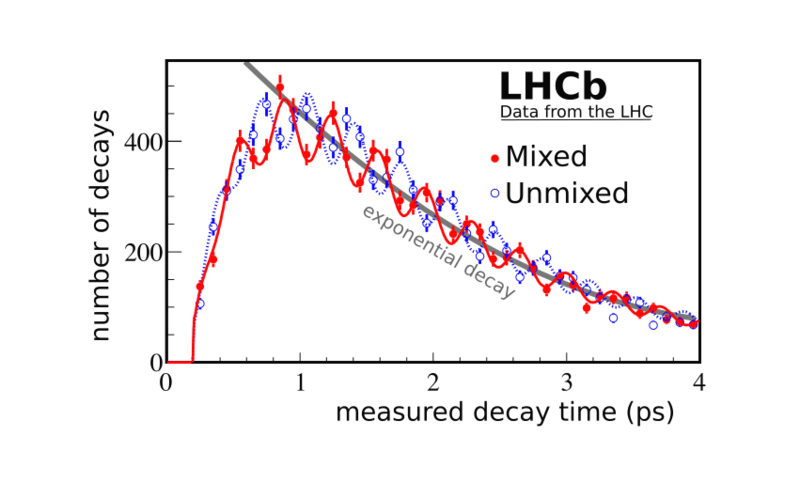 The region with no data at small values of the decay time is due to detector acceptance effects. The exponential decay of the system is a property of all matter on small scales. The particles decay over time but do not age, i.e. the probability for them to decay is a constant and doesn’t change with time. This site was created for the 2016 Royal Society Summer Science Exhibition.